MY LIBRARY OF THOUGHTS: Review: An Incomplete Education by Judy Jones and William Wilson. Review: An Incomplete Education by Judy Jones and William Wilson. 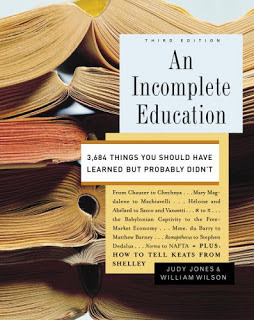 "An Incomplete Education: 3,684 things you should have learned but probably didn't." Apart from fiction book, i do read a lot of non-fiction books as well. Infact I should say "lots n lots n lots of non-fiction books. I started off with non-fiction to begin with. Non-fiction has helped me a long way in every step of my life. When i was pregnant, i read all the possible pregnancy books, same with when i had kids. I read "My 1 month old", My two year old", all books relating to their age, development, their mental growth, physical growth, potty training, behaviors and what not. Non-fictions are the best help by far. The best self knowledge, self understanding, self educating books. I still read lots of non-fiction but dont review them. This book here is very interesting. As the name say "An Incomplete Education: 3,684 things we shuld have earned but didnt." Well, we will learn now. Its never too late. This book delivers the information from a variety of disciplines in the hope of filling the educational empty blanks. The subjects that this book covers is American Studies, Art History, Economics, Film, Literature, Religion, Psychology, Religion, Music, Political Science and World History. The information provided is very interesting and its an easy read. In some places i was really engrossed n some places was left laughing. The author has very brilliantly sorted out the most interesting information and chose those things that people should have learned but might never have absorbed. Just for fun, I am going to quote some of the interesting question which i came across and found the answers which i could hardly believe it was true and how ?? 1. Were the ancients really scientists or did they make some lucky guesses? 2. Did Newton really watch an apple fall? And if so, so what ? And if not, so what ? 3. Is science worth dying for? 4. Did Galileo really drop a couple of lead weights from the Leaning Tower of Pisa, thereby proving sumthing or other? And on and on and on .... This is just the Science subject I put forth. There many subjects that I mentioned above to gain knowledge. The difference really is one of information vs. knowledge. This book provides information; it is up to readers to pursue real knowledge. And real knowledge cannot come from skimming through 700 pages and memorizing 3,684 facts. But this book is a fun read, and it's a good place to start in the journey toward knowledge. Every author teaches u a lesson. We know this by how they capture our minds , how they engage us in their writings. This is the trade mark of an author and what I learned" "Write what others want to read, not what you want to write." Great post. Just found your blog and will be back to read more! well post.you get many post reader.